Before planning a trip to India you might be wondering what you will do in the overseas country and what you will eat, etc. India is a country with fabulous variety of cuisines as there are so many different cultures here. A first timer to India finds mostly spicy food everywhere but these 5 Eating tips &things to do in India helps you. This is one of the most important things that you have to check before you make a trip to India. There are several to choose from including religious pilgrimage sites, wildlife sanctuaries in India, or beaches in India. Most regions also have some old mansions that are many centuries old to preserve the culture. If you are visiting India in winter you will also find snowfall in different parts of North India like Shimla, J & K, and Ladakh Leh, and find snow capped mountains of the Himalayas here. It is a scenic view to visitors and this is a memorable experience to have in your life. There are various cultures, languages, people and cuisine in India. Hence, you can taste mouth watering traditional delicacies from each region. 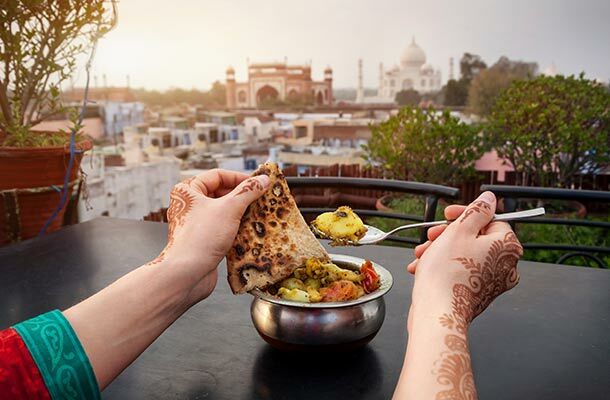 Here are 3 top foods from 3 famous tourist locations in India. i) Rajasthan - Rajasthan Thali & Sweets are most famous all over the country and you’ll enjoy the unique taste in traditional style. Tourists who go 2-day /night camping enjoy this food with a beverage and folk performance by traditional artists in the cold night sand. ii) Varanasi - This is mainly with pilgrims and tourists who like to visit religious sites. Often prasad is served here. There are few food options and it does not have many taste options as mostly pilgrim’s visit here. iii) Agra - A famous sweet known as ‘Agra ka Petha’ made from vegetable has many variants and flavors which you must taste if you have a sweet tooth. Luxury travel in India is one of the latest trends with the top notch people and several international tourists from world around. Foreigners who would like to see the top tourist attractions in India while traveling in luxury can go for one of the Indian luxury trains such as Maharajahs Express or Palace on Wheels. if touring North & Western Indian States. The Golden Chariot and Deccan Odyssey are specific to certain states like Maharashtra Goa, Karnataka and Southern states of Kerala/ Tamil Nadu. Meals and accommodation is with the train travelers so there is not much that you have to do other than enjoy your week in luxury on wheels unless you plan an extended stay to tour/ visit other regions in India. There are a few places in India to take a traditional spa and the most famous and specialized place to do it is Kerala. It will restore peace in you and rejuvenate you once again. Many tour packages are available when you tour Kerala in India where travelers can also take a health spa which may or may not be included in the package. This could be for anti-aging spa, health treatments for various ailments, detoxification therapy to name just a few. There are also wellness resorts to have a few days away from the busy and polluted city life. Moreover, you can spend time floating on water in a luxury houseboat ride in Kerala which is very famous with tourists. So do try it out in India. Many temples are open for tourists to visit and take blessings. During festival times you must not miss out these vibrant religious processions. They are colorful with people disguised as mythological characters and sometimes Gods and Goddesses and take out a procession. You can also witness life size silver / golden colored chariots such as mythological transportation and huge statues and sometimes makeshift cut-out houses also. Many hundreds of people flock to such places in India to celebrate main festivals like Diwali, Holi, Dusshera, and significant festivals. So, when you visit India do take time out during a festival period to visit one of such famous temples in India. You will be surprised at some of the traditional eating habits and don’t surprise others when you visit. So these tips will help you to know before coming to India and avoid such kinds of culture surprises. When eating with your hand, eat only with one hand which is your right hand. Wash your hands / use hand sanitizer before eating for hygiene reasons. Eating from banana leaf or other leaf is still done in many villages. So, they may offer you food served on a banana leaf. People from one household sit around in a circle on the floor to eat meals like lunch/ dinner which is common in the rural areas. They might offer a chair to you if you’re a foreigner to sit on and eat. Snacks are packed in old newspapers to save on packaging. Old newspapers are used as tissue paper at many small food kiosk! So if you’re hands get greasy/ oily with deep fried food and you’re short of tissues then make use of the newspaper wrapping. There are many eating tips and things that you will learn after coming to India, it is an amazing experience!